use of the drugs to treat various other infections and ineffective drug control policy. ment as a main target for the elimination of infection. phylactic effect of the recurrence of ulcer bleeding . well tolerated antibiotic regime for the treatment of H.
several factors that could lead to the treatment failure . 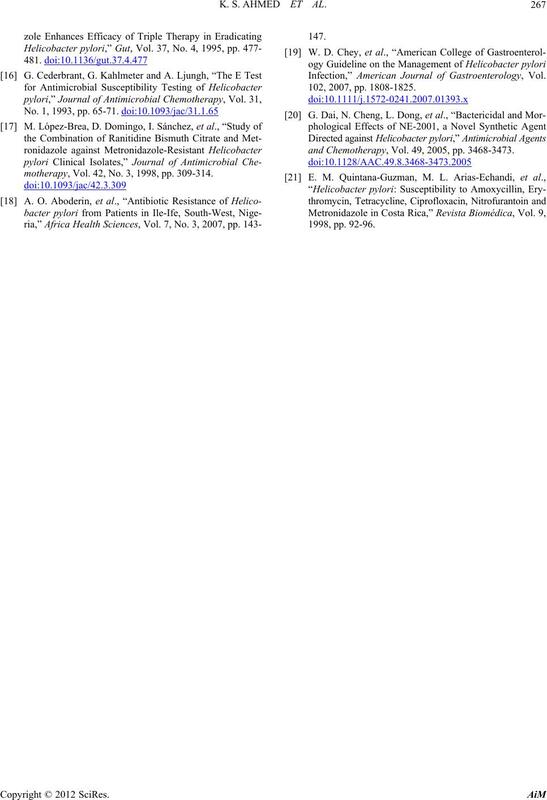 K. S. AHMED ET AL. 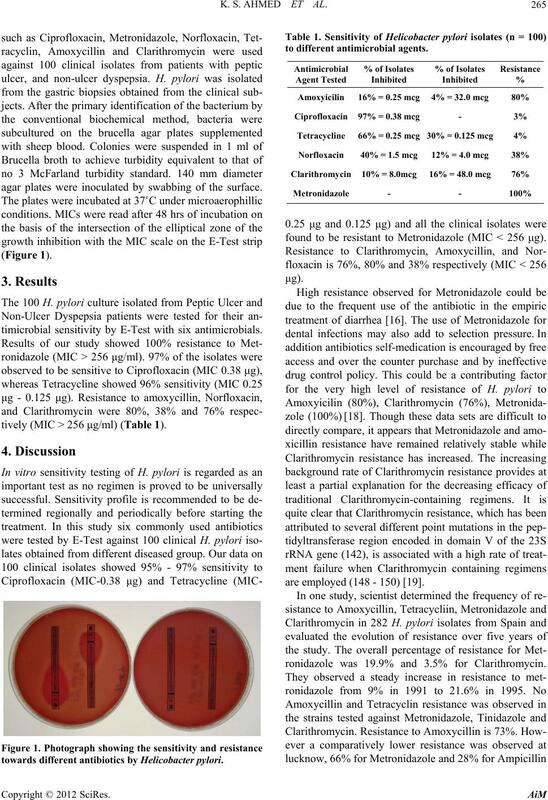 increase in the metronidazole resistance from 9% to 33%. xycillin and 7% for Clarithromycin and tetracycline. larly before deciding the therapeutic regime. electron microscopy and similar DNA patterns of the H.
population and guide the selection of antibiotics. the organism and their correlation with clinical outcome. ure the MIC of the organism. 8.0 μg and Ciprofloxacin > 1.0 μg . ment be determined hence the importance of this study. agar plates were inoculated by swabbing of the surface. timicrobial sensitivity by E-Test with six antimicrobials. tively (MIC > 256 μg/ml) (Table 1). 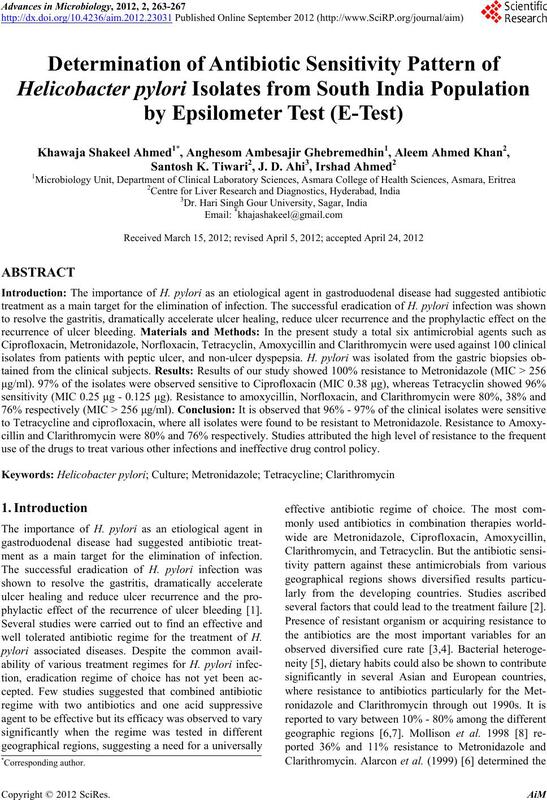 towards different antibiotics by Helicobacter pylori. found to be resistant to Metronidazole (MIC < 256 μg). are employed (148 - 150) . ronidazole was 19.9% and 3.5% for Clarithromycin. frequent use of the antibiotics to treat other infections. with different strains of H. pylori. biotic in eradicating H. pylori in this environment. lin and Clarithromycin were 80% and 76% respectively. 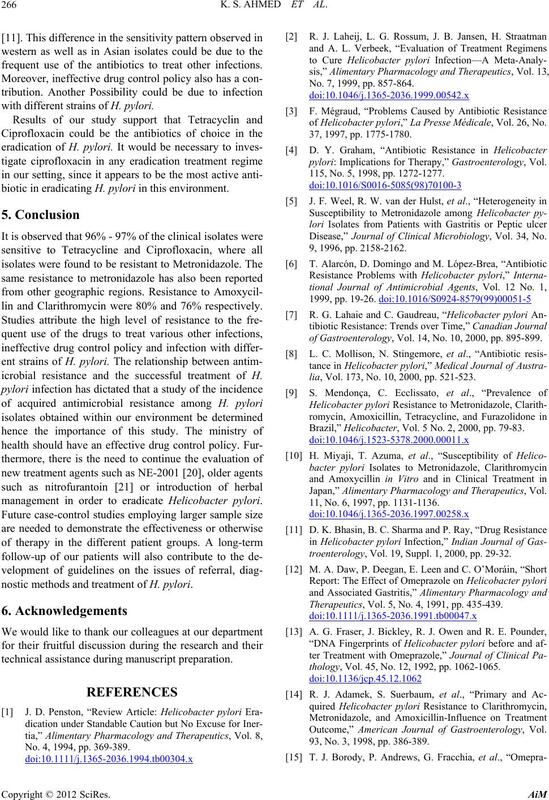 icrobial resistance and the successful treatment of H.
management in order to eradicate Helicobacter pylori. nostic methods and treatment of H. pylori. technical assistance during manuscript preparation. No. 4, 1994, pp. 369-389. No. 7, 1999, pp. 857-864.
of Helicobacter pylori,” La Presse Médicale, Vol. 26, No. pylori: Implications for Therapy,” Gastroenterology, Vol. 115, No. 5, 1998, pp. 1272-1277. 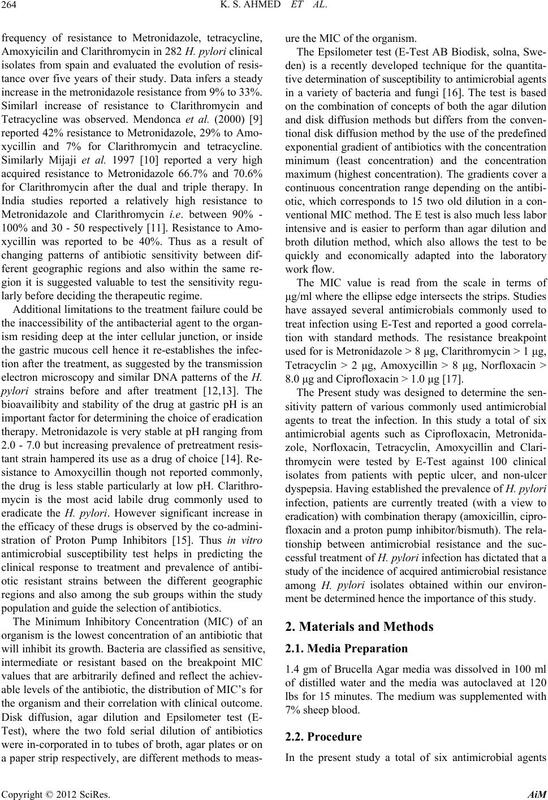 Disease,” Journal of Clinical Microbiology, Vol. 34, No. of Gastroenterology, Vol. 14, No. 10, 2000, pp. 895-899.
lia, Vol. 173, No. 10, 2000, pp. 521-523. Brazil,” Helicobacter, Vol. 5 No. 2, 2000, pp. 79-83. Japan,” Alimentary Pharmacology and Therapeutics, Vol. 11, No. 6, 1997, pp. 1131-1136.
troenterology, Vol. 19, Suppl. 1, 2000, pp. 29-32. Therapeutics, Vol. 5, No. 4, 1991, pp. 435-439.
thology, Vol. 45, No. 12, 1992, pp. 1062-1065. Outcome,” American Journal of Gastroenterology, Vol. 93, No. 3, 1998, pp. 386-389.
motherapy, Vol. 42, No. 3, 1998, pp. 309-314. Infection,” American Journal of Gastroenterology, Vol. and Chemotherapy, Vol. 49, 2005, pp. 3468-3473.